Spring and fall are good times for groups to visit the park. The park is an excellent outdoor class­room. Clearly marked trails and large picnic areas can easily hold large school groups. We offer guided hikes and programs based on class size. Call the park to set up a field trip for your group. We have many self-guided tools for groups to use. Please contact us in advance if you plan to bring a group, even if you are not requesting a park-led program or hike. Staff and volunteers also offer free programs and hikes every weekend all year long. Take a guided nature walk, attend a program or listen to story time. View wildlife through high-powered scopes from the observation deck or tower. 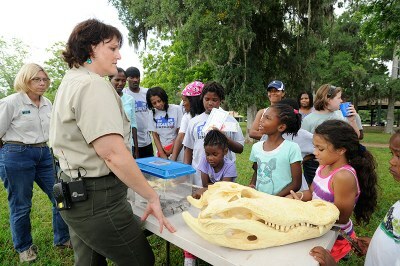 Participate in a pond life demonstration or discovery station. Visit our Events page to see schedule of park programs. Nature Center: Learn about the park’s ecosystems and inhabitants. Con­tact the park to arrange a group visit during the week. 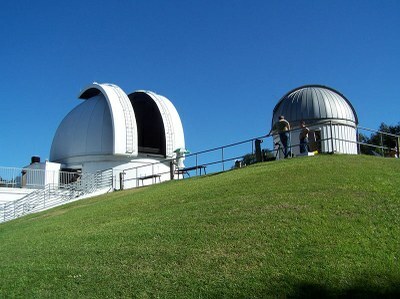 The center and gift shop are open weekdays 11 a.m. to 3 p.m. and on weekends from 9 a.m. to 5 p.m.
George Observatory: Explore the cosmos through high-powered tele­scopes at the George Observatory - Houston Museum of Natural Science located in the park. The observatory is open on Saturdays from 3 to 10 p.m. For information on programs or passes, visit the observatory website or call (979) 553-3400 or at (281) 242-3055. Wildlife Observation: Visit the observation deck on Elm Lake and the tower at 40 Acre Lake. Both offer excellent viewpoints for spotting birds, alli­gators and other wildlife.